Sailboat Cruising Lifestyle what do you do all day ? 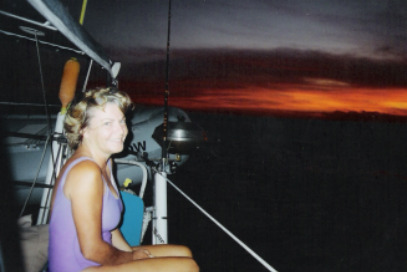 Living the sailboat cruising lifestyle is a major unknown for most people. It's a great way to enjoy frugal retirement living. A common question is what do you do all day? Nothing really unusual... what you do on land using what is available on the boat. Here is how we would recommend you get started. Note the real teak grates, had these made in Trinidad, very cheaply. You can also tell the fact that the dinghy is missing, that we have already been ashore that day...or are planning to leave soon. When the dinghy is in the water the waves make a slight noise that would not bother most people but it does a sailboat cruiser,see more later in the article. A typical day if you are by yourself, and that is your choice. You get up, half of us do anyway, at first light, make coffee eat a light snack, grab a book and go up top (that's in the cockpit). We both read a lot on the boat...always had a book going. This might be great time to read the classics, or John Grisham may be more your style. Now if you are gone 6 to 9 months you will run out of books right? Wrong, remember you are living the sailboat cruising lifestyle with other people in the same boat so to speak. You do book exchanges...you get together, bring several books you have read, put them on the table or sand and take a book from someone else. This works surprisingly well for everyone. The uniform of the day...Check these 4 cruising ladies and 1 guy out. Is this Vogue and GQ or what? Footware, because you occasionally will get wet, needs to be water proof. Every cruiser, and I mean every cruiser wears Teva sandals, You can get them wet no problem. Do you wear any other shoes?. 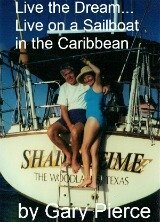 Here is a 2011 interview we did answering questions about sailboat life Ten questions for Shadowtime . 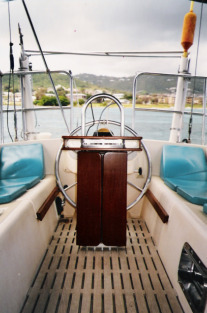 If you returned to the boat in the afternoon, and knew you were staying aboard, you haul your dinghy out of the water using the davits. Its a 2 person job made easy by the block and tackle pulley system. The captain gets the engine side, the mate gets the bow...hey its only fair. Why do you pull your dingy out of the water? Security, if your dingy is in the water it would be easy to steal. It happened , not to our friends, but it happens. 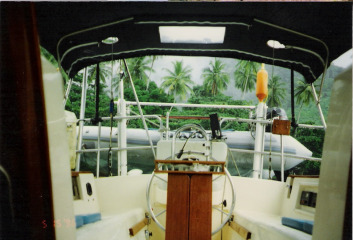 We had a hard and fast rule on the boat, no projects of any kind started after 3PM. 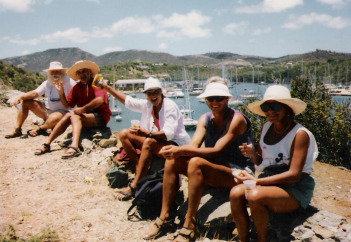 You retire to enjoy the sailboat cruising lifestyle to relax and enjoy yourself. Some projects have the tendency to get drawn out and take longer than anticipated. So no new work after 3PM and you will never miss a sunset...right. A shower then quiet time in the cockpit. A little rum and or beer then dinner. Ah what a life.